1Phytochemistry Division-Pharmacognosy- Phytochemistry Laboratory, Faculty of Pharmacy Universitas Muslim Indonesia, Makassar- INDONESIA. 2Pharmacognosy Division-Pharmacognosy- Phytotochemistry Laboratory, Faculty of Pharmacy Universitas Muslim Indonesia, Makassar- INDONESIA. Aimed: Determine the potential of Cordia myxa L. leaf on inhibited α-glucosidase. Material: ELISA Kit, Ethanol 96%, Colomn Chromatography, n-hexane, ethyl acetate, Glocobay®. Method: Sample from Cordia myxa L. leaf extracted by ethanol 96% then evaporated to get the sticky extract. 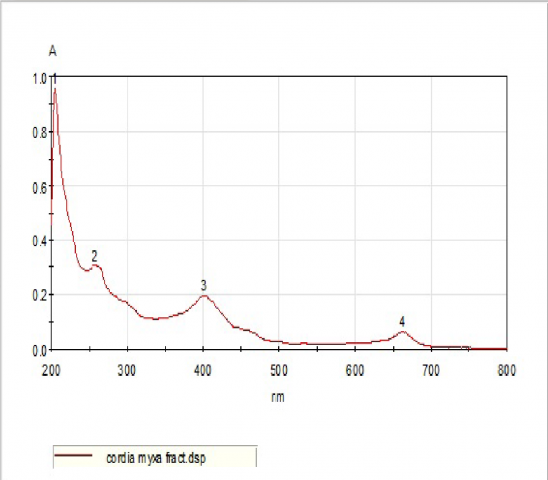 The sticky extract of Cordia myxa L. leaf fractionated by column chromatography with n-hexane, n-hexane: ethyl acetate (90:10; 80:20; 75:25; 70:30; 65:35; 60:40; 55:45; 50:50) Assay: The fractions assayed by ELISA (Enzyme-Linked Immunosorbent Assay) with acarbose (Glucobay ®) as the comparator. Result: The results showed that the n-hexane fraction is the highest potency on inhibited α-glucosidase with the noncompetitive mechanism. The IC50 of n-hexane fraction is 0.53 ppm been while the acarbose is 6.85 ppm. Conclusion: The n-hexane fraction of Cordia myxa L. leaf has the highest potency to use for possible decrease blood glucose level. Najib A, Ahmad AR, Handayani V. ELISA Test on Cordia myxa L. Leaf Extract for alpha-Glucosidase Inhibitor. Pharmacognosy Journal. 2019;11(2):358-361. Maltase Inhibitory Activity of Aqueous Extracts of Zingiber officinale Rosc. and Trigonella foenum-graecum Linn.